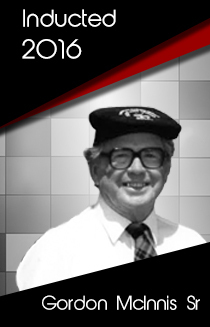 Gordon McInnis Sr. was the Golf Professional at Lookout Point Golf Club in Fonthill, Ontario for over 50 years and made Lookout “The Home of Champions“. Gord has been recognized as an elite Instructor, having worked with Hall of Fame Members Marlene Stewart Streit and Cathy Sherk. Gordon has been honored numerous times for his contributions to the game of golf, including; OGA Outstanding Contribution to Golf in 1973, Honor Roll PGA of Ontario in 1977, PGA of Canada Teaching Award in 1991 and was inducted into the Ontario Golf Hall of Fame in 2001.